Protect your counters with this Webstaurant brand cutting. 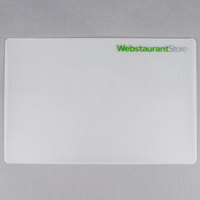 Featuring the "WebstaurantStore" logo in the top, right hand corner, this translucent cutting board can be shaped, bent or made into a funnel. Because it is flexible, it is perfect for adding chopped vegetables, meats, and herbs directly into pots and pans without any spilling. Its thin design makes it easy to store without taking up a lot of room, but it does not compromise its durability. This cutting board is strong enough to handle chopping with all types of knives. I love this small cutting mat, it is small enough to fit in a drawer but big enough for many small jobs. The cutting surface holds up well to being chopped/cut on, and I love it that it is flexible which makes it even easier to use the cutting mat to transfer the cut materials to a pan or bowl. nice ad flexibe cutting board mat it comes in a pack of 2 the price is really good and its easy to clean i recommend it !! Everyone needs to have a few of these flexible cutting boards on hand. It is so lightweight and easy to clean. These are smaller and perfect for small jobs. Good quality cutting mat for small tasks. The flexible plastic lets you scoop cut vegetables into storage containers or into pots. Made of a decent plastic. These are perfect for quick chopping tasks. These are pretty small so they fit just about anywhere but they don't work great with a long knife. The Choice 11.5" x 7.5" cutting boards are great bang for you buck plastic cutting boards. I don't think you can beat the quality for the price. The plastic is a sturdy and smooth. I also own the 12x18 and they are my go to cutting boards for the vast majority of prep work. These smaller sizes boards are much more fitting for smaller jobs and a great addition to my kitchen. Cleanup is easy and while they do get scratches and cut marks over time, they have held up better than other plastic cutting boards I've bought and have yet to get stained. Just overall a solid product at a beyond great value. Cheap and small, perfect for little jobs or portability. Can roll these up and put them in a small pocket. These are great for small serving sizes where you can just shuffle the items into a bowl once processed (think mincing garlic, etc.). Great flexible cutting board for the price. They are thicker than many other budget friendly cutting boards i have purchased, I primarily use flexible cutting boards and have been through many. The size of these are small, but they are perfect for my college kids and for preparing small quantities of food. Great little cutting board, I have it on my counter top at all times because it take up no space and its clear so you done see it. We have used these mats for years and never found anything as good. They were a bit thinner for awhile, but now they are nice and thick again. Awesome product!! I love how it's so flexible and perfect size for when I cut vegetables. Very good price for a great product. Definitely would recommend to others. This is the greatest! I love having them for cutting veggies it makes it quick and easy to move vegetables into a pot after it’s been cut! These cutting boards are easy to store a large quantity. I would not recommend using for any prep that is not dry, since there is not catch for liquid. Do you know what's great about a flexible cutting board? Getting your cut product from your board to your container. All you have to do is pick it up and fold up the sides to funnel your cut product into a container. No more scraping the product off the stiff board with your knife only to knock it into the floor. Go ahead and buy one of these for your sous chef -- they will thank you! At such a low price, these flexible cutting boards offer fast, easy, convienant options when you have a small cutting job. They are lightweight and very slim so storage is very easy. They flex nicely for pouring cut items into bowls or pots! These are perfect for cutting up small fruits and veggies and the cutting board is small so it does not take up to much space. This works like a charm. Cut up your veggies and pick up the board to throw them in the pot. They are thinner so they store well and run through the dishwasher with no problem. These are the perfect size for small cutting jobs--fruit, bar use, etc. I like the fact that I don't have to take up the whole counter while doing a small cutting job. These are awesome! Super thin so you can store them anywhere and actually work great! I use them to cut fruit every single day and they look brand new (no marks from the knives). Highly recommend! These cutting boards are very inexpensive, durable, handy to use, and easy to store. They are also able to be folded to easily pour their contents into a mixing bowl. I love this little cutting board I use it a work to cut up small amounts of fruit, and it's flexible which makes it really easy dump the strawberries into the pot. This board is not going to last forever after a few months I'm starting to have some nice cuts in the surfaces, but this was a 2 pack for really cheap, when these get destroyed I will defiantly buy more. they are small and handy. I use them when chopping herbs. they are flexible so you can fold and pour everything into the bowl/pot easily. I put them in the dishwasher and they hold up well except there are scratches everywhere. To be honest, I received these for free. They are what you would expect from plastic cutting boards. I prefer sturdier boards but these are good for small projects. These flexible cutting boards come in a 2 pack. They are perfect for cutting up fruits or vegetables. They are very easy to store. Perfect! This compact little 7.5 by 11.5 inch cutting board if perfect for small jobs. It's small size is makes it easy to store and it's flexible so it perfect for chopping things then dumping them in the pot! I love these cutting boards in all sizes. They are durable, easy to clean, and very flexible yet strong. It makes chopping everything from herbs to vegetables a breeze. These were smaller than I thought but that was my fault, I should have payed attention to the size in the description. Still good for cutting up smaller item like fruits and veggies. as long as you don't use these boards for any tasks that are too heavy duty, these little flex boards work great. the price is just right and for something like cutting citrus behind a bar, they're great. Never had anything like these cutting boards. They are so light and flexible that they are truly easy to work with. Just be careful not to cut through it if you have a really sharp knife. Compared to the larger versions of this cutting board, I like this cutting board. It is quite small, so it's good for peeling garlic, cutting one fruit, or prepping garnishes. These are great cutting boards but do crack after awhile. So you may want to buy extras. It is easy to scoop foods up and dump into different size pots. Choice 7 1/2"X11 1/2" Webstaurant logo flexible cutting boards in a pack of two. They are flexible and can be rolled up for storage and slightly folded after use to help keep discarded extras on to help carry to the trash! The choice 7 inch and a half 11 inch 1/2 webstaurant logo cutting boards, I was disappointed truthfully, they're just flimsy pieces of course film?? :-/ fast shipping, but that's ok.
We appreciate your review! If you have any concerns about the cutting board you purchased please contact our Customer Solutions team. These are nice little cutting boards. The perfect size to have on hand when you just need to chop up one item. I love that it's flexible, so you can just bend it and then drop your product right into your pan without spilling any. I recommend purchasing a non-slip cutting board mat to go underneath this. This Flexible Cutting Board is really good for home use. If you don't want to get out your big cutting board and want to cut something real quick, this is great. It's easy to clean and doesn't take up much space. Definitely recommend! I never thought that those flexible cutting are helpful as they are, i love for i can use not only for cut, also help in works like table cover. These are such nice little cutting boards. The small size is great for when you need to cut-up smaller things or just one of something. They are nice quality as well. Great for small kitchens. Holds up great in top rack of dishwasher. Keeps counters damage free and is easy to store in the knife drawer. This flexible cutting board really is perfect for small kitchens with small prep work. It's very foldable and thin, so it doesn't take much space at all! Great little product for this price, was a little bit smaller than I was expecting. But this would work great for small jobs like lemons or limes. I LOVE these cutting boards!! This small size is perfect for small jobs. And they wash well in the dishwasher. Can't beat the price either. I love these flexible cutting boards. They are cleaner than wood boards. The ability to flex makes it easy to pout food into pots. The price is great! This is a neat flexible cutting board. i use it for storing fondant pieces to dry. They do not stick to the board and use less space on the counter. I converted to using this style of cutting board years ago. I came across this while browing the website. The size of this one makes it great for traveling. The price is amazing. These are not for any heavy duty butchering, but for light use. These cuting boards don't last forever. I will purshasing more in the future. The flexibility of these are what makes the product. It is then easy to lift and empty into a bowl, or whatever, the ingredients without any spillage. We're very happy with this little cutting board it's flexible which allows it to be used to transfer items you chopped and it's great for the small cutting jobs the 2 pk is priced right from WEBstaurantStore. I love using these mats to put on the table while I'm decorating a cake. It works great to contain any spills and we even put them in the dishwasher. I love how small and easy this cutting board is to store. It isn't yuck or long so it doesn't take up much space, but it works great and is easy to clean. These cutting boards are awesome. Super flexible and a great practical size. Non bulky and easy to store anywhere. Great to take on camping trips and to have inside the RV. This is a great little cutting board! It is flexible but not too flimsy. The small size makes it nice and portable. I have noticed that it is much thinner than the other flexible cutting boards that I have, but so far seems to be pretty durable. Awesome cutting mat!! It takes up virtually no space and holds up perfectly well. We cook and cut and chop a LOT in this household and I usually grab the oversize version of this cutting board, so my onions can spread out, as I usually chop or slice up multiple onions per meal. But when I have small needs, it's nice to not have to take up so much room on the countertops, or in the dishwasher. These are a GREAT value. Our company uses these frequently as a dry separation between ice and products for sale. They're wonderful -- affordable, arrive quickly, and get the job done. Does the job. It is a small cutting board I use it to cut lemons on for lemonade so it works great for me. It is very durable after a year it is still in one peace. I would more call this a cutting mat than a cutting board. I don't think it would hold up to heavy cutting or chopping. We use it when cutting strawberries or apples with a fruit dicer or paring knife. For this purpose it works perfectly! Great value. These flexible cutting boards are our favorite! They are easily stored, thin enough to slip under existing equipment on the kitchen counter. We highly recommend this product! These are not very good especially if you have sharp knives. I just use them now to prepare food. They are great for that at least. This is a great affordable cutting board for behind the bar. Its paper thin and surprisingly holds up really well. Cleans easily and is almost invisible. These cutting boards are great when you need some small and quick to cut on. They are convenient to store and easy to clean. I use these more than my larger cutting boards. My satisfaction with this has decreased over time due to the bending. It started off nice and straight. However, it's so thin and has curved up on all edges. These are the perfect size for chopping one onion or a few cloves of garlic for dinner, or grating cheese onto for easy transportation to the container. They slide on smooth counters, so put a towel or silpat underneath for traction. A great little board for a very inexpensive price. It is very small, but for slicing just one piece of fruit it works well. It is starting to get roughed up after a few months, so I do not expect it to last real long. I wouldn't recommend the boards for long-term use or durability. However, I use them periodically when I teach youth and adult cooking lessons and they are very convenient. Great little cutting board. Works great for chopping herbs. It's flexible so you can bend and add your chopped item directly to the pot without it falling off. Only wish it was a little wider. Nice small cutting board and they fit any where. Very easy to clean and easy on the pocket book. lasts a long time and when they get bad it doesn't hurt to throw them away. These are very durable, inexpensive cutting boards. They are very small, and maybe even smaller than you're imaging - they're good for cutting herbs, small vegetables, and / or fruits that are not juicy. They have lasted quite awhile, however warp quite easily with heat. These cutting boards work so well. Overall, they are a great purchase, and make slicing up ingredients a breeze, due to the flexibility of the board. I would recommend this product. Perfect size for chopping and apple or onion. It is nice to have a small board like this to do little jobs. I did cut a slit in the side of one accidentally after sharpening my knife but other than that, it is holding up pretty well. This a great cutting board to keep behind the bar to cut extra fruit on the fly, it is nice and small so it can easily be stored behind the bar. This is a great little cutting board, very sturdy and easy to use. The flexibility and ability to fold what you've cut to dump in a bowl or dish is very convenient. We love using these! These are VERY small and thin, so best applied to cutting a small fruit or vegetable, for example. Not for heavy duty use. Easy to clean and store, however. Definitely worth the price. These boards too warp after several months of use but that can be expected with all flexible cutting boards. Useful for cutting small amounts of volume and easy to wash and clean! These come in handy around the kitchen and are easy to clean and store, because of the thin size. They don't move around as much as standard heavy weight cutting boards. These small flexible cutting surfaces are great for the morning treat sharing, we keep them under the bagel slicer as to not mar the tables. they also are great for small cutting tasks like cutting apples for a lunch snack. I use these for cutting everything! They are such a great price and are easy to use as well as easy to clean, which is a big deal with cutting boards. Definitely a great buy. Good for basic cutting. I wouldn't want to use these for anything that required larger knives or maybe even really sharp knives. It is flexible so it is thin. We also sometimes use these as drain stops, in fact use them more for that than cutting. Convenient to use, wash and store. Perfectly sized for smaller tasks and priced just right. I Will definitely be buying these again in the future! Nice, simple cutting board that gets the job done. Not ideal for any kind of serious butchering, but perfectly good for cutting fruit or other small jobs. Talk about cutting down on our laundry! These little things have made a tremendous impact on our operation - the speed at which we start a new sandwich build has improved dramatically. Simple little cutting boards. Nice ot have a bunch of these around to quickly grab, but they are not really great for large volume work. Cute cutting board for easy travel. Convenient when I need to cut something simple (like a lemon for a drink) and don't want a dirty a regular cutting board. Being flexible is an added convenience when dumpling scrap trash or a few cut vegetables into a pan. I found these cutting boards, 7 1/2"x 11 1/2" 2/pack, as I was searching online. It turned out these were the best for "small" size cutting boards, without having to get a full package of various sizes. Good quality too! These small flexible cutting boards are great for taking on the go camping. They are also easily stored in just about any kitchen drawer when not in use. This cutting board was a free gift along with my clover honey purchase. It is a nice size for easy storage. A nice cutting board to have for cheese platers and parties. These are great small cutting boards. I use mine to Mince things. But any thing you need to cut up and poor into your food this will work great! This cutting board was a free gift with my purchase made for my daughters wedding. It is a nice size for easy storage. A nice cutting board to have for parties. These cutting boards were super cheap and perfect for behind the bar to cut fruits for drinks. They easily run through the dishwasher. They don't take up any space. These bendable cutting boards are convenient for storage and great for cutting fruits and vegetables. Not ideal for meats but still a great product to have and affordable as well. I love Choice 11 1/2" x 7 1/2" Flexible Cutting Boards, and they are easy to take to events, to use at the bar for fruit, and at home. Light but sturdy. These work very good and are not just for cutting, but great for keeping foods clean before use, or cutting. They roll up, or slide under just about anything. This cutting board is great for chopping food then picking up the entire board and scooping the food directly into the cooking vessel. Very durable and then throw it in the washing machine for easy cleaning. And best yet, you get two in a pack. These are very sturdy cutty boards. They are a great price and can be discarded after each use, but you do not have to. They can be used many times and cleans up easily. These are great for bartenders who need to cut fruit but don't want to go and get a huge cutting board out of the kitchen. Light and sturdy a great item. Great item for cutting bar fruit. They take up very little space so they are great for transporting (catering, outdoor bar, etc) or to be left on the bar top without taking up a lot of space. I love this product! It's thin size allows me to store it in the tiniest spots and chop vegetables with ease, without needing to pull out a huge wooden cutting board. very nice flexible cutting board. easy to clean and store. one of my favorite thing about this product is how cheap it is and the plastic is thick. Nice size cutting board! Great price for a cheap and inexpensive cutting board! Great for home use! Good for on the fly prep and easy to take almost anywhere!!! Easy to quickly add ingredients to a soup or sauce! !